Product detail:Bold make-up, lack of sleep, packed agenda, stress, hectic life… Your skin can feel overstrained and becomes dull. 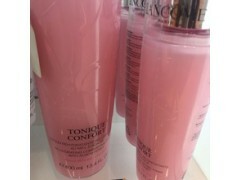 1.Remove makeup and impurities with Eau Micellaire Confort. 2. Cleanse and dry skin. Pour a generous amount of the milky pink water into hands then pat gently into skin. Soak a cotton pad with the pink liquid and gently wipe on to skin. To gently exfoliate your skin to remove dead skin cells and gives your skin a smooth and baby-soft, even texture try Rose Sugar Scrub. Use Hydra Zen Jelly Mask overnight for an intense moisture surge.